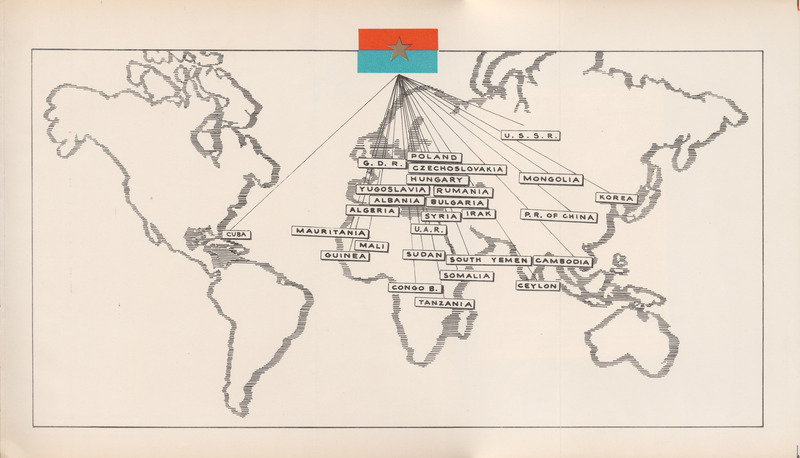 This fold-out map of the world shows an unusual connection between the National Front for the Liberation of South Vietnam (NFL) - represented by its flag - and 27 other communist nations and parties from Cuba and the Soviet Union to Tanzania. The location of the NFL flag at the top of the map gives it the appearance of dominating the worldwide communist movement. The NFL was formed in late December, 1960, for the purpose of overthrowing the government of South Vietnam and reunifying the country under communist rule. The NFL came to have a variety of components, military (the Viet Cong), political, and diplomatic. Following the psychological advantage it gained in the 1968 Tet Offensive, the NFL formed the Provisional Revolutionary Government to participate in the negotiations that led eventually to the Paris Peace Accords of 1973. For the opposite view, see ID #2042, "The Whole World Is With Us," showing 31 nations supporting South Vietnam and the U.S.
South Vietnam on the Road to Victory. 1971. n.p. South Vietnam: Giai Phong Publishing House.